Follow their official user manual. I think they need to provide some more detailed examples in their manual. I use this cheat sheet for my own use a lot. Review, update and share any comments. To assign activity, use “activity” or “a” followed by constituent name. “fugacity” command (“f”) is used to set gas fugacities (on an atm scale) for the calculation. a species, mineral, or gas. Equilibrium constants are given as log(10) K’s at 0°C, 25°C,60°C, 100°C, 150°C, 200°C, 250°C, 300°C; values of “500” represent a lack of data at the corresponding temperature. does what it says, quits the program. Great command. It copies your reaction to the clipboard. You can then easily paste it to word. It does what it means. Use: ionic_strength=.5; or I=.5; or IS=.5 to set the ionic strength of the solution. polymorph Two compounds that have the same composition, but different crystal structures are said to be polymorphs. Examples: calcite/aragonite, quartz/coesite, forsterite/wadsleyite, sillimanite/andalusite/kyanite. 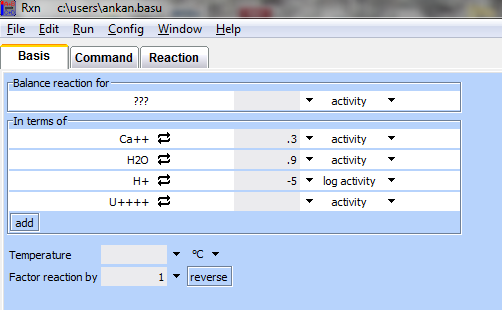 “ratio” command is used to set activity or fugacity ratios for the calculation. Use this to run a reaction. This command can be used to look for various values within the model. This command does the same thing as factor -1. This command will save a concise database. This is a very powerful command as it can be used to change the set of basis entries. Use this command to set the temperature. How to use the BLOCK command in RXN. Send me any info that you may have. Not sure how to set up the redox-coupling properly.